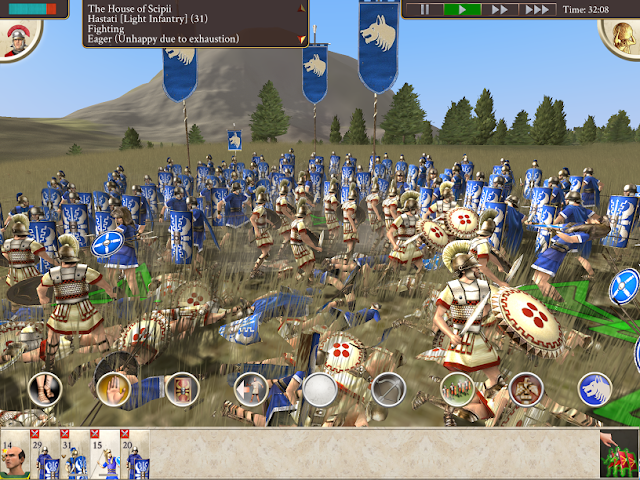 As a platform, the Apple iPad and other tablet devices are perfect for strategy games. The immediacy of interaction, through touching units and characters to direct them about, has an experiential element that helps strategy games as well, making you feel like an omnipresent commander with a military force at his or her fingertips. For whatever reason, though, developers and publishers have been reticent to bring their best strategy franchises to the platform. 2K has only released the pared down Civilization Revolution, rather than the 'proper' games in the series. Paradox Interactive hasn't bothered looking at a mobile Europa Universalis, and until now, SEGA's Total War games on mobile have been mobile titles with little connection to the real franchise. Whether that hesitation has been due to developers having concerns about releasing premium-priced games on the mobile platform or a genuine lack of power to run them, I'm not sure, but I do hope that Total War: Rome puts some of those concerns to rest. 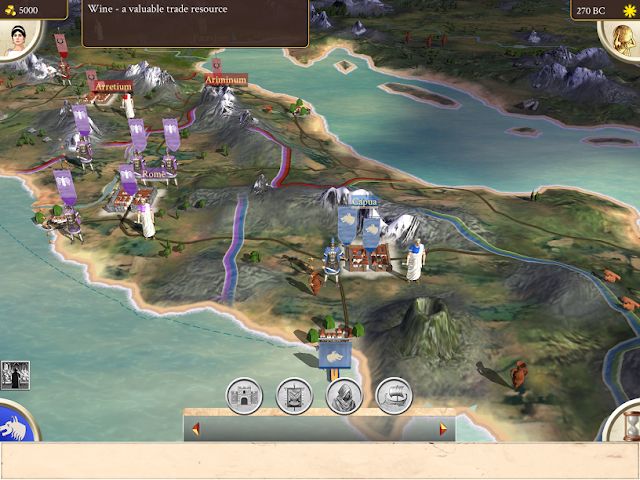 As a port of one of the earlier Total War games, Total War: Rome shows its age with the visual engine. Though the battles themselves are large in scale, where dozens of units can be clashing with one another at one time, individual characters lack detail and the battle maps are quite plain. The aesthetics aren't why people play these games though, and Total War: Rome, though plain, is easy enough on the eyes. 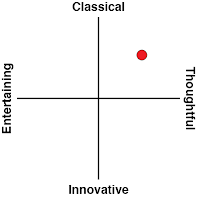 What is relevant is that the game has effortlessly maintained its strategic chops, and boy will this game test your strategic capabilities. For those that haven't played a Total War game before, you actually get a mix of grand strategy and RTS to deal with, which will mean that both higher strategy and tactical thinking is essential. For the most part, you'll be spending time looking at an overworld map, where you'll build up cities, form armies around generals, engage in diplomacy with dozens of different factions, and direct units around the map to either attack enemies or defend borders. This all plays out a little like a Civilization game, with less focus on the development of a nation (through scientific discoveries and so on), and more emphasis on the day-to-day concerns of an empire. When hostile units meet one another on the overworld map - that is when things turn very different, and where Total War differentiates itself from Civilization and Europa Universalis. 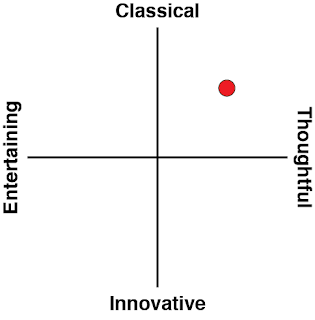 Those games simulate the results of battles, based on the relative strengths of the two forces. In Total War you can get down into the battle and get your hands dirty. Then, just like in a RTS game, you'll be commanding units to manoeuvre and attack, keeping in mind a unit's strengths and weaknesses, trying to hit enemies from the side or behind, and trying to ensure your own units don't break and flee off the map. You can pause the action at any point to issue new orders to units, so there's never an overwhelming sense of having to deal with skirmishes on multiple fronts at a time, and it's so very rewarding to spin what would have been a loss in Civilization or Europa Universalis into a victory against a superior force with clever tactical manoeuvres. As the game progresses there will be a constant stream of battles, so to keep things streamlined there is the opportunity to skip this RTS segment on any individual battle and have the AI determine the winner. The AI tends to be expensive, in terms of the units and soldiers you'll lose in this way, but it's a handy way to skip through overwhelming victories that are quite pointless to fight out. This is very much the kind of strategy game I like to play. It’s a real spectacle watching legions of soldiers slowly marching across the battlefield, even as archers behind their ranks pepper the enemy with arrows, and fast-moving cavalry circle around and use their manoeuvrability to come up behind an enemy's exposed flanks. 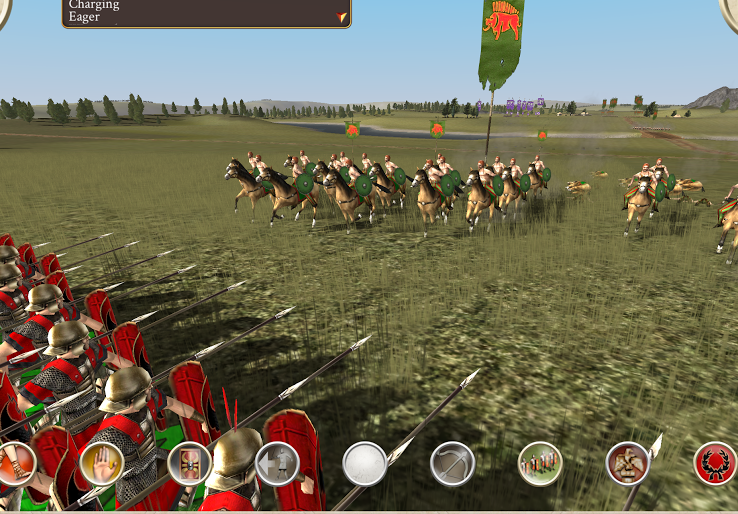 The design of the game allows for players to engage in similar tactical manoeuvres that the Romans themselves used, and the historical authenticity of what goes on is impressive, even if you'll be changing history by winning battles that should have been lost. I like games that are historically authentic and valuable as learning artefacts. At the same time, I like the empire-building of grand strategy. There's a real cerebral thrill in watching an empire grow from humble roots to encompass a wide swathe of land. 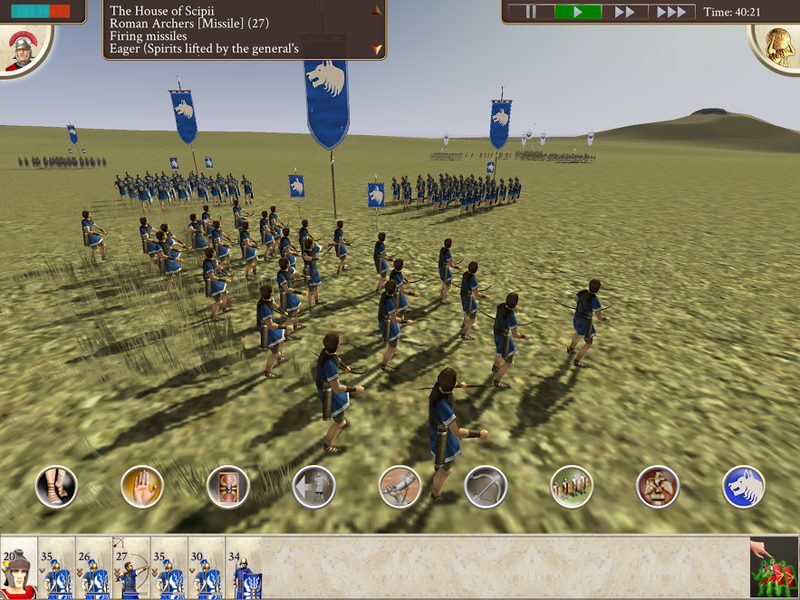 RTS titles focus on the moment-to-moment action and the flow of units around the battlefield. Grand strategy games focus on the shifting borders and the context of the pivotal battles throughout history. Total War is that rare game that provides the best of both worlds. It helps if you're familiar with the history of the Roman Empire, of course. The game offers an authentic recreation of the environment and factions within each scenario. Of course events in the game will veer wildly from what happened in real history because your involvement as the leader of a faction will mean you can attack the scenario in a different way to what your historical peers did; but the more you understand what really happened in history, the better you'll appreciate the challenges that are ahead of you. You'll also have a general idea of how military strategy worked back in the day, what tactics were effective, and this can help to guide your own decisions. That being said, Rome: Total War also acts as an educational resource for anyone whose understanding of Roman history is more limited. I know mine is, and after playing the game I had a much better sense of the political dynamics of the time, which I can now go and research further. I've long been a fan of games that can inspire people to learn more, and I certainly consider the Total War series to be a fine example of that tradition. Related reading: Another really good iPad game that mixes grand strategy and RTS is Autumn Dynasty: Warlords. Matt's full review.